It seems like cheating to count this for any reading challenges, as it was so short. I picked it up at the clearance sales last year, so I knew it was a slim volume. I didn’t realize that it was mostly pictures. However, it is a nice little story about Winston Chruchill secretly heading to the U.S. to see President Roosevelt after Pearl Harbor was attacked. He spent the holiday in Washington, attended the tree lighting and church service with the Roosevelts and then spoke at the President’s holiday radio address. So, this is a nice book to have in my library, but it didn’t run as deep as I’d hoped. 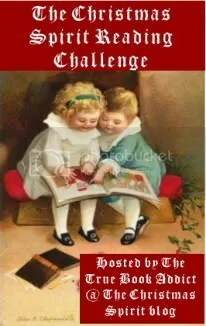 Christmas in July in December doesn’t officially start until December 1, but since I am still finishing up Travels with My Aunt, I think I will be ok.
Then there is The Christmas Spirit Reading Challenge. Technically, this has already started, but I am pretty sure I can catch up. And if I finish these in time, I shall be reading A Christmas Carol again.